Not to be confused with Xiaolongnü. Avalokiteśvara with Longnü (left) and Sudhana (right). Longnü (traditional Chinese: 龍女; simplified Chinese: 龙女; pinyin: Lóngnǚ; Sanskrit: nāgakanya; Vietnamese: Long nữ), translated as Dragon Daughter, along with Sudhana are considered acolytes of the bodhisattva Avalokiteśvara in Chinese Buddhism. However, there are no scriptural sources connecting both Sudhana and Longnü to Avalokiteśvara at the same time. It is suggested that the acolytes are representations of the two major Mahāyāna texts, the Lotus Sūtra and the Avataṃsaka Sūtra, in which Longnü and Sudhana appear, respectively. The depiction of Longnü and Sudhana with Avalokiteśvara may have been influenced by the Jade Maiden (Chinese: 玉女; pinyin: Yùnǚ) and Golden Youth (traditional Chinese: 金僮; simplified Chinese: 金童; pinyin: Jīntóng) who both appear in the iconography of the Jade Emperor. She is described as being the eight-year-old daughter of the Dragon King (traditional Chinese: 龍王; simplified Chinese: 龙王; pinyin: Lóng Wáng; Sanskrit: nāgarāja) of the East Sea. Longnü depicted as a female bodhisattva in China. There is the daughter of the nāga king Sāgara who is only eight years old. She is wise; her faculties are sharp; and she also well knows all the faculties and deeds of sentient beings. She has attained the power of recollection. [note 1] She preserves all the profound secret treasures of the Buddhas, enters deep in meditation, and is well capable of discerning all dharmas. She instantly produced the thought of enlightenment (Skt. bodhicitta) and has attained the stage of nonretrogression. She has unhindered eloquence and thinks of sentient beings with as much compassion as if they were her own children. Her virtues are perfect. Her thoughts and explanations are subtle and extensive, merciful, and compassionate. She has a harmonious mind and has attained enlightenment. However, the Buddha's disciple Śāriputra, a Sravaka, does not believe that a woman can attain buddhahood. [note 2] In response, the nāga maiden offers a pearl to the Buddha, symbolizing her life and ego, and he accepts it. She then instantly transforms into a perfected male bodhisattva, and then attains complete enlightenment. According to Schuster, the Lotus Sutra´s argument "is directed against the notion that some bodies (male) are fit for the highest destinies, and other bodies (female) are not." 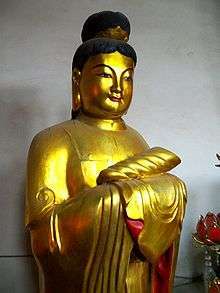 In Chan Buddhism, the story was taken as an example to emphasize the potential of sudden awakening. A single chapter in the Complete Tale of Avalokiteśvara and the Southern Seas (Chinese: 南海觀音全傳; pinyin: Nánhǎi Guānyīn Quánzhuàn), a sixteenth century Ming Dynasty novel is the first text that connects Longnü and Sudhana together as being acolytes of Avalokiteśvara. When the Dragon King's third son was out for swim in the sea in the form of a carp, he was captured by a fisherman. Unable to transform into his dragon form due to being trapped on land, he was going to be sold and butchered at the local market. Once Avalokiteśvara learned of his predicament, she gave Shancai all her money and sent him to buy him from the market and set him free. Because the carp was still alive hours after it was caught, this drew a large crowd and soon a bidding war started due to people believing that eating this fish would grant them immortality. Shancai was easily outbid and begged the fish seller to spare the life of the fish, but to no avail and earning the scorn of the people at the market. It was then that Avalokiteśvara projected her voice from far away saying, "A life should definitely belong to one who tries to save it, not one who tries to take it". The crowd realizing their mistake soon dispersed and Shancai was able to bring the carp back to Avalokiteśvara and return it to the sea. As a token of gratitude, the Dragon King asked Ao Guang to bring the "Pearl of Light", but his granddaughter volunteers to go in his father's place instead. 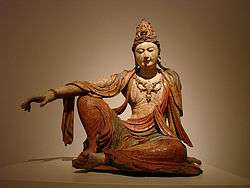 After offering the pearl to Avalokiteśvara, she decides to stay with her and become her disciple to learn the Buddhist Dharma. Unlike the Complete Tale of Avalokiteśvara and the Southern Seas which only briefly mentions Longnü, the Precious Scroll of Sudhana and Longnü (Chinese: 善財龍女寶撰; pinyin: Shàncái Lóngnǚ Bǎozhuàn), an eighteenth-nineteenth century scroll consisting of 29 folios, is completely devoted to the legend of Longnü and Sudhana and seems to have a Taoist origin. The text is set during the Qianfu period of the Tang Dynasty. One day when Sudhana is walking down a mountain path to visit his father he hears a voice crying out for help. Upon investigation, it turns out to be the voice of a snake trapped in a bottle for the last eighteen years. The snake begs Sudhana to release her, upon which she turn into her true form, that of a monster, and threatens to eat him. When Sudhana protests at the snake's behavior, she makes the argument that than ēn (恩, a kind act) is repaid by a feud, and that is the way of the world. However, the snake agrees to submit the argument to three judges. Three years later, Sudhana formally becomes an acolyte of Avalokiteśvara along with the Filial Parrot. After the snake has submitted itself to seven years of austerity, it cleanses itself of its poison and produces a pearl. It then transforms into Longnü and becomes an acolyte of Avalokiteśvara. ↑ Watson and Kato leave the term dhāraṇī (Kubo: recollection) untranslated. ↑ Wilt 2008, p. 30. ↑ Kubo 2007, pp. 191-194. ↑ Meeks 2010, p. 68. ↑ Kubo 2007, pp. 191-192. ↑ Kato 1975, p. 134. ↑ Watson 2009, p. 226. ↑ Levering 2013, p. 149. ↑ Peach 2002, p. 56. ↑ Kubo 2007, pp. 192-193. ↑ Ueki 2003, p. 278. 1 2 Kubo 2007, p. 193. ↑ Murano 1967, p. 46. ↑ Levering 1982, pp. 22-23. ↑ Schuster 1981, p. 44. ↑ Levering 1982, pp. 24,27. ↑ Meeks 2010, pp. 104-105. ↑ Wilt 2008, p. 34. Kato, Bunno; Tamura, Yoshirō; Miyasaka, Kōjirō, trans. (1975). The Threefold Lotus Sutra: The Sutra of Innumerable Meanings; The Sutra of the Lotus Flower of the Wonderful Law; The Sutra of Meditation on the Bodhisattva Universal Virtue (PDF). New York/Tōkyō: Weatherhill & Kōsei Publishing. Levering, Miriam L. (1982). The Dragon Girl and the Abbess of Mo-Shan: Gender and Status in the Ch'an Buddhist Tradition. Journal of the International Association of Buddhist Studies 5 (1), 19–36. Meeks, Lori Rachelle (2010). Hokkeji and the reemergence of female monastic orders in premodern Japan. Honolulu: University of Hawaii Press. Schuster, Nancy (1981). Changing the Female Body: Wise Women and the Bodhisattva Career in Some Maharatnakutasutras. Journal of the International Association of Buddhist Studies 4 (1), 24–69. Wilt L. Idema (2008). Personal salvation and filial piety: two precious scroll narratives of Guanyin and her acolytes. University of Hawaii Press. ISBN 9780824832155.